Floating vanities: Have your contractor build the vanity on the wall; this leaves open space at the bottom, giving the room a more airy feel. This works especially well if your bathroom has a nook that the vanity can be built into, attaching the ends to the side walls. Adding tile accents to the wall above the vanity, or to the entire wall, will add glamour and style. There is nothing more luxurious than in-floor heating! This can be accomplished with electric in-floor or hydronic system. Just imagine walking into the bathroom early in the morning, and feeling warm tile under your feet! Frameless glass showers are undeniably luxurious. While you are having the glass shower doors re-done, why not make it universally accessible by having your contractor install the shower pan without an edge or lip? Not only does this add a spa-like quality to your master bath, but aging family members will appreciate it! What about seating in the bath? Whether you want a spot to sit down and towel off or a place to lean back and relax for a few moments, a cushioned chair or ottoman ups the comfort level of any bath. Most of us enjoy some music while in relaxing in the shower or soaking tub. Include a shelf for your mp3 player (have your contractor install an electrical outlet there), or go for a state-of-the art sound system for your master bath. Heated towel bars provide you with warm towels for after your shower; this idea is almost as wonderful as a heated floor! Don’t forget a seat in the shower. Tile a bench to match the rest of the shower; or add a bench made of a contrasting material like teak or glass. While you are having that done, include a steam feature or multiple shower heads. Storage! Storage can be attractive and plentiful, if you have enough square feet. For smaller bathrooms, creative solutions can be found. Installing shelving in a wall; utilizing any nooks for shelving or cabinets. Beautiful custom cabinets will upgrade your bathroom and provide practical storage solutions. Adding skylights or sun tunnels will brighten up a dark bath. Strategically located lights are important also! The NAHB (National Association of Home Builders) has reported that modification of homes for aging-in-place is the fastest growing segment of the residential remodeling industry. NAHB collaborated with AARP to develop the Certified Aging-in-Place (CAPS) program to meet the increasing demand by senior and baby boomers for barrier-free living environments. The U.S. government’s Administration on Aging, states that by 2030 there will be approximately 71.5 million Americans over the age of 65. There is a growing segment of the remodeling industry dedicated to assisting the increase of an aging residential population to remain in their homes. This client wanted to be sure of a sturdy grab bar at every location around and in the shower. Bath remodelers are tuning in to the mechanics of assessing a client’s needs and integrating all the factors needed to provide an aesthetically pleasing, functional solution. The solutions include installing bath and shower grab bars, tub-to-shower conversions, walk-in tubs, shower seats and other safety features that aid when reduced eyesight, lack of flexibility and poorer balance become issues. NAHB’s CAPS program is designed to teach individuals involved in residential design and construction about the needs of older adults who are balancing current and future needs for autonomy and independence with safety and security. Aging-in-place modifications are being incorporated in something called Universal Design. This design concept is used for both remodel and new construction. It includes things such as grading entry points to the home to create step-free entrances, accessible floor plans (such as wider hallways for wheelchair access), and for new construction, universal designed kitchens and bathrooms as well as stacking closets so that elevators can be installed in the future. Home modifications can ease the physical challenges we all face without turning the home into a clinical setting. Innovative companies like Kohler are using universal design principles combined with beautiful aesthetics for non-stigmatizing results. Assessing the needs of the homeowner and developing the right solution means a remodeler can expand their current source of business while providing needed services to those who wish to remain in their homeas long as possible. 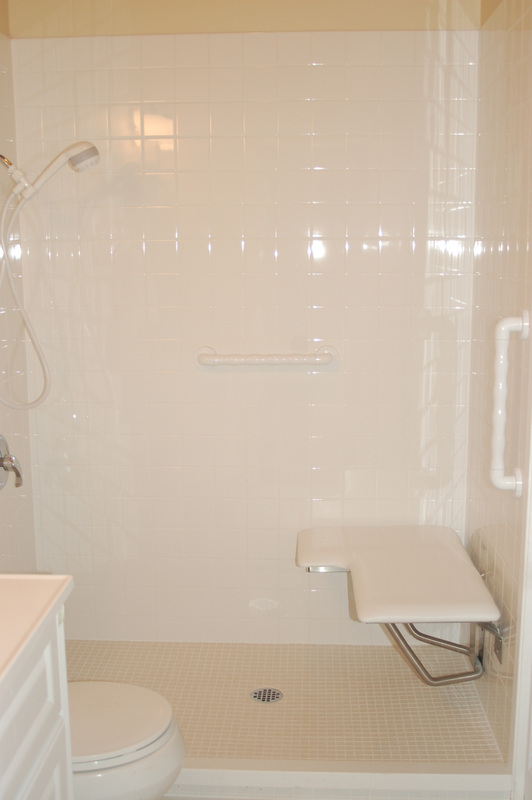 This tiled shower with built-in seating and grab bars was designed for a client who suffered reduced mobility. Real estate values are still struggling, and people are viewing their homes not as investments, but as their homes! In other words, the trend is to stay in place and do makeovers for a more livable home. Because of this trend, home remodeling is expected to increase during the second half of the year, making 2012 the strongest year since 2006. Driving the market will be midsize kitchen and bath projects, maintenance work and energy-efficiency upgrades. In fact, Americans are now spending more on remodeling than on new construction, according to Stephen Melman of the National Association of Home Builders (NAHB). He states that we are moving less now than at any time since WWII. A survey of Better Homes and Gardens magazine stated that 61% of consumers wanted to get the most value for their budget – bargain hunting, in other words. The survey also found that consumers are most interested in style upgrades to countertops, flooring, faucets and fixtures, followed by general maintenance, decor updates, efficiency and home organization. There’s a trend from formal to informal living, says Jerry Levine, president of the Washington, D.C. area remodeling firm Levine Group Architects and Builders. He says his high-end clientele, who spend an average of $240,000 on renovations, want space to be comfortable, not fancy. Outdoor connection – resulting in larger windows, decks, or porches. Livable kitchens – the kitchen is the new living room; shifting away from wall cabinets which can block views to a living area. More open floor plans – kitchen that connect to the living room, dining area and the outdoors. Togetherness – the open living core encourages coming together. Smaller master baths – doing away with spa tubs, reclaiming that space for larger shower and vanities. Better use of space – reconfigure existing space to make it work better. Energy efficiency – clients are requesting more efficient windows, doors and insulated walls. Mudrooms – Americans seek to reduce clutter and drop rooms or mud rooms provide a space to put items without cluttering up the living space. 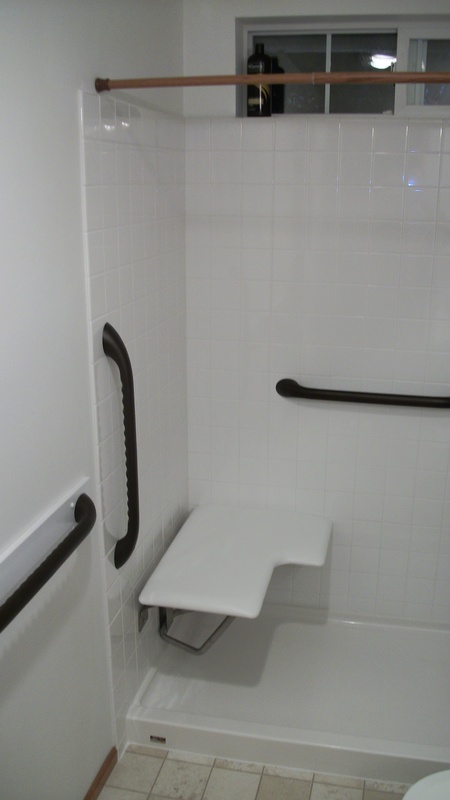 Universal design – for aging in place as baby boomers need more ADA rated showers, entries and doorways sized for wheelchairs and ease of access. Shower remodeled for Aging-in-place. Note bench, handicap bar and hand-held shower wand. Our own DyLon McClary earned his CAPS certificate in January 2011, knowing that our aging population would appreciate hiring contractors who are well-trained in designing for their particular needs. A recent article in Builder Online highlights the issues of our aging population and what we can do to help them stay in their homes longer. 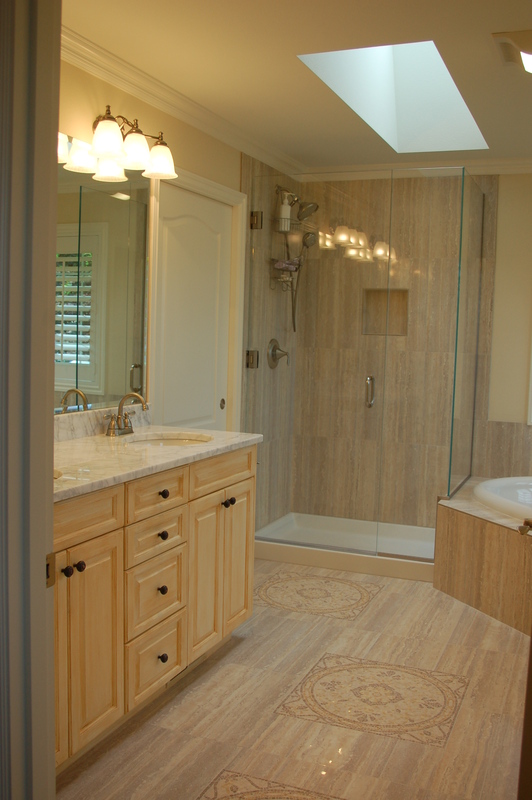 Our company has remodelled many bathrooms our area, to make them work for the older clients. Being able to help our clients remain in their homes, while creating a beautiful tiled shower is a real satisfaction! Check out the issue of Builder Online; it is chock-full of great information. ‘They’ say that 10,000 Americans per day are reaching age 65. What does this mean to you? Think accessibility. If your grandmother has to move in with you, can she use the shower safely? If you want to remain in your home and YOU are the one reaching/ waving as you pass age 65, can you use that bathroom safely? It’s called “universal design”; that is, designing a bath (or the whole house for that matter) with accessibility in mind. Thanks to the increasing demand for such products, you can design for accessibility and you don’t need to fear that your home will look like a nursing home. The colors and tile selected make this shower look warm and inviting. So go to the website of Housing Zone dot com and find out all the info available there. Rose Construction has our own DyLon McClary, CAPS certified – (Certified Aging in Place Specialist). January is National Bath Safety month. The photo above shows a bath remodel we did in 2011 to make it handicapped accessible. We installed tile in the shower and included a bench with a solid surface seat. Grab bars were installed and a hand-held shower wand accessible from the bench. 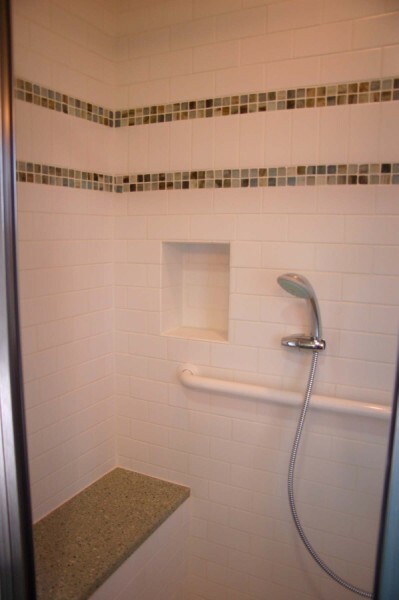 This photo shows another handicapped accessible shower we installed in a bathroom remodel for an elderly couple who preferred to remain in their home. These photos show that making an accessible, safe bathroom can be beautiful and stylish. Set the hot water temperature lower than 115 degrees. Keep all cleaning supplies out of reach of children or locked in cabinets. Keep all medications out of reach or locked where children cannot access them. Bathroom surface that could get wet (pretty much all of the bathroom floor and shower/tub) should have non-skid surfaces or mats. Never leave young children unattended in bath or shower. Grab bars are necessary installations for elders who may have become unsteady on their feet, and for children. 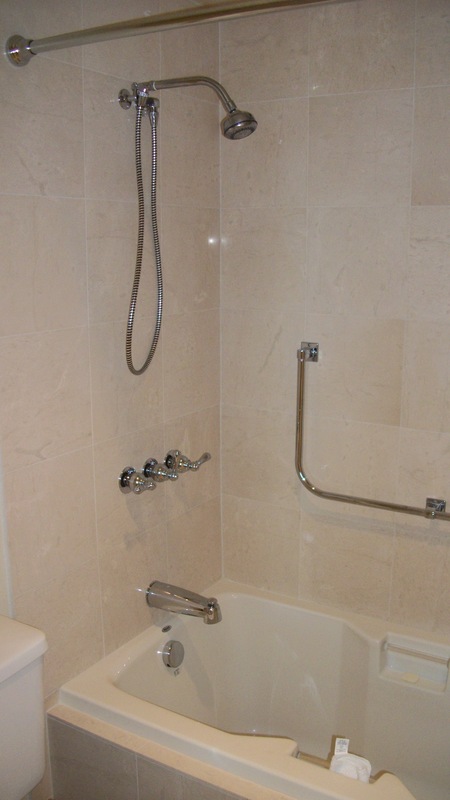 Shower seats are important to help avoid slips and falls. The folding type is a good option that can be folded up and provide more room in the shower for those who do not need it.